Domino’s Pizza, which, for the past two years has based its marketing efforts around a very public self-improvement initiative, is taking transparency to (quite literally) new levels. The company is allowing customers to post their unvarnished reviews on a Times Square billboard. This is what happens, apparently, when you take your marketing philosophy from Sun Tzu and his Art of War. 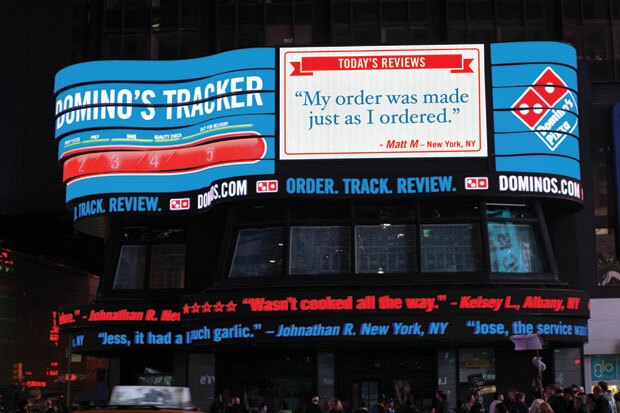 The company, America’s largest pizza delivery chain, has commandeered a giant digital billboard at the famous intersection of 44th Street and Broadway and, starting today, is letting any customer who orders food using the Domino’s Pizza Tracker app the opportunity to share their feedback with hundreds of thousands of Manhattan pedestrians, tourists from around the world, and, well, pretty much everyone else via a web video feed. Barring profanity and irrelevant rants, no comments will be excluded, no matter how negative. “We’ve had this tracker for about three years, but we felt it was time for a coming out party,” says Domino’s chief marketing officer Russell Weiner. Created by Domino’s agency Crispin Porter + Bogusky, the Domino’s Tracker allows customers who submit their orders online (over 40% now do) to track their food from the oven to their front door, and will even give them the names of the cook and delivery driver. Once the order is received, customers can rate their experience and can leave comments for restaurant staff. The Times Square ad will run for two hours and 54 minutes per day, and will pull in approximately 700 comments, at a rate of four per minute. It’s the latest component in a public reinvention campaign that kicked off at the end of 2009 with Pizza Turnaround, which saw Domino’s acknowledging its bad reviews and setting about changing its recipe. Subsequent iterations included “Show Us Your Pizza,” wherein Domino’s asked customers to upload photos of actual pizzas to ShowUsYourPizza.com, with the chance to win cash and an opportunity to have their images used in an ad campaign; the company was also eschewing fancy food photography in favor of undoctored pizza pics. More than 30,000 images of actual pizzas have been uploaded. Weiner says the campaign strategy was inspired by the book, The Art of War, in which Sun Tzu says the best way to win a war on an island is to blow up the bridge. With death or victory as the only options, troops have to fight for their lives, because there is no other way out. Perhaps because Domino’s has experienced, firsthand, the power of social media in informing consumers’ opinions of a brand–a video of Domino’s employees abusing customers’ food went viral in April of 2009. Lately, the company has been one of the industry’s most notable case studies in transparency in marketing. And the approach has paid off. Domino’s dough has risen. Same-store sales growth increased 10.4% between 2009 and 2010, according to company financial disclosures. During the first quarter of 2011, same-store earnings were up 2.3%. An earlier version of this story incorrectly stated that Domino’s was the country’s largest pizza chain. The company is the largest delivery chain.